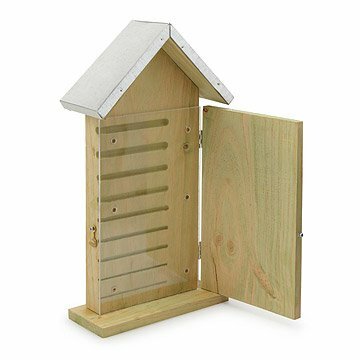 Attract solitary pollinators to your garden with this handcrafted pine mason bee house, designed to let you peek into the secret lives of bees when you open the side door. A plexiglass pane allows for kids of all ages to observe the fascinating nest solitary bees create to raise their young. Perfect for the budding entomologist or seasoned green thumb, this bee haven brings you closer to nature, and your garden will thank you for it. Made in China. The range in diameter of the nest cavities allow for bees to choose the size that's right for them based on their species and preferences. I love the idea of this but the holes are drilled so that they get smaller towards the bottom.. The bottom half holes are so small the bees can't enter. Feels like a waste.. Wish it worked better! My in-laws put this up in their garden and it has worked wonderfully - every single slot except the very bottom one has been taken up by various insect species and there are a variety of cells filled with different larvae. This is a great gift for geeky scientists and naturalists! My dad loved this unique surprise for his birthday as he is an avid gardener, nature lover, and bee enthusiast. Great idea and looks great...except they screwed the plastic cover in without flattening it first so it has a huge hump in it. The door won't close, could never close and I am honestly fascinated that anyone would box this up and send it to a customer. Quality check is non existent. Sending it back as soon as I have time. I love the idea of this product ... my wife wants to raise bees and this will provide her a chance to observe her insect friends and get to know the ... will also enhance our garden as I am planting bee-attracting flowers. I expected pure pine ... was surprised to receive pressure- treated, but that will contribute to longevity. I bought this for my father-in-law who is an avid gardener, and amazing grandparent to my kids. He absolutely loved it, especially the opening see-in feature, which will be a hit with my kids, because they love to help him in the garden in the summer. He was thrilled with it and I'm glad I went off list and got this for him. This is something I never would have thought of on my own, but popped up on Uncommon Goods, and I knew immediately it would be useful. After all, a garden can never have too many bees. My only dissapointment with this product is that it appears to be made using treated wood. It says made from pine wood and the photo online looks like white pine. However, the wood of my bee house has an obvious green tint to it, which I assume means its chemically treated against decay. I only worry that it may not be safe for the bees. I wish this information had been clear either online or on the product itself. The product seems nice otherwise. Create a buzz in your backyard with this rustic mason bee habitat.